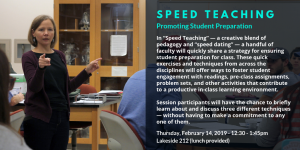 One of our goals as a Center is to foster innovative, evidence-based teaching and learning practices and critical reflection through workshops, reading groups, and invited speakers involved with national and international research on higher education. 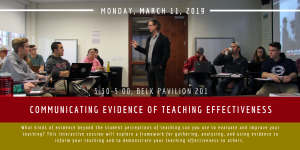 Workshops & Events are free and open to all faculty and staff teaching at Elon, and are designed for instructors working in a range of teaching and learning contexts. 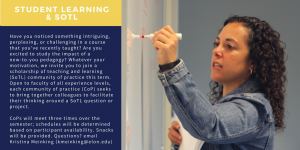 Descriptions for current and past CATL offerings can be found below. Are you excited to try something new in a current course and want to reflect on how you might document its impact on student learning? Have you noticed something intriguing, perplexing, or challenging in a course that you’ve recently taught? Our conversations will help enrich your thinking about SoTL and identify the ways in which the SoTL scholarly process aligns with research processes already familiar to us from disciplinary frameworks. 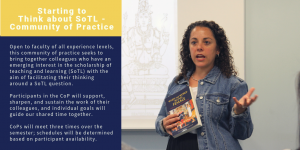 It will also introduce members to resources helpful to the development and eventual publication of a SoTL project. CoPs will meet three times over the semester; schedules will be determined based on participant availability. 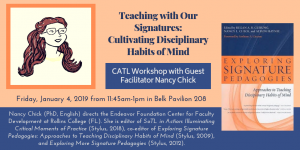 Fifteen years ago, Lee Shulman introduced the idea of “signature pedagogies,” or approaches to teaching that cultivate disciplinary habits of mind. This concept challenges us to ask some pointed questions: how does the biologist, for example, teach so that her students experience thinking like a biologist and even doing biology? How does the historian teach students to practice historical thinking? How does the artist teach students to see the world through artists’ eyes? What about the other disciplines? And ultimately, why should the biologist, the historian, the artist, and the rest of us care? 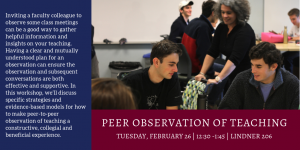 In this workshop, participants will begin to map their relevant signature pedagogies, including addressing some of the criticisms and creative adaptations that have emerged in recent years. How can we find “air & light & time & space” for writing once the craziness of the teaching semester has set in? How do we keep the flame of our research alive without burning ourselves out? When we are under pressure, our writing can all too easily become a site of frustration, guilt, and shame. Yet an abundance of research has shown that productivity and pleasure are bedfellows, not enemies; writers who strike the keys with joy are more likely to become engaging communicators, skilful wordsmiths, and prolific researchers than those who struggle to get words onto the page. 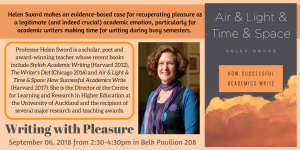 This evidence-based workshop will help you establish and maintain a productive writing practice by rediscovering the pleasures of writing. Her popular academic writing workshops have taken her to more than 70 universities, conferences and institutes in North America, Europe, Asia, Australasia and Africa. See her website (www.helensword.com) for links to her books, her digital poetry and the Writer’s Diet test, a free diagnostic tool for writers. In Facilitating Seven Ways of Learning, Davis and Arend suggest practical tips for matching your learning goals with the most effective teaching methods. The authors divide the book into seven categories of learning outcomes (such as, building skills, developing thinking and reasoning processes, practicing professional judgment) and connect those to different ways of learning and teaching that research suggests support those learning outcomes effectively. Whether you are looking for new ways to improve student learning or simply continuing to fine-tune after years of experience, Facilitating Seven Ways of Learning can offer new ideas and also remind us why we make the effort to improve our facilitation skills. Join colleagues for this two-part discussion of the book over lunch. Please plan to attend both sessions. 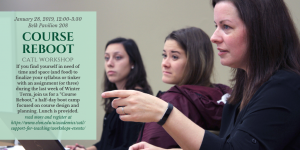 Interactive Lecturing is designed to “help faculty members more effectively lecture,” in ways that combine purposeful student learning activities with engaging lectures. The authors share tips, strategies, and techniques applicable across a wide variety of disciplines. 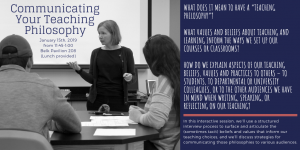 On June 19th, we will explore the theoretical framework of the book as we define interactive lecturing and discuss what it looks like in practice. 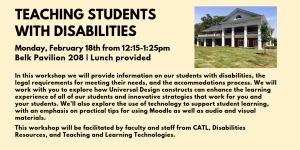 On July 10th, we will explore tips, strategies, and techniques as well as sharing at least one technique that we have modified for use in our own classroom. Whether you are planning a new course or re-thinking one you’ve taught before, you can sign up to be part of a course design working group. Groups meet 3 times during the summer—often over lunch—based on group member’s schedules. 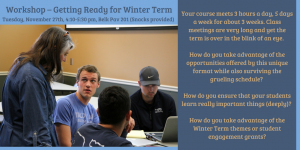 During the meetings, we’ll discuss each course, using a backwards course design framework and focusing on the questions and topics that most interest you as you design it. Participants in the CoP will support, sharpen, and sustain the work of their colleagues, and individuals’ goals guide our shared time together. 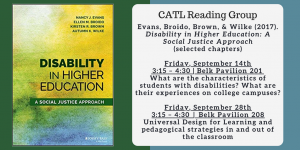 To view more of our CATL events, see below for previous years.